The Turkmenistan-Afghanistan-Pakistan-India gas pipeline will further draw Russia into peace-building process in South Asia. Last week Ashgabat organised an international oil and gas conference, in which Turkmen President, Gurbanguly Berdymukhamedov reiterated his country’s position to build gas pipeline from Turkmenistan to India through the territory of Afghanistan and Pakistan. This 1700-kilometre pipeline (TAPI) is estimated to carry 3.2 billion cubic feet natural gas per day to the energy hungry countries to the south. 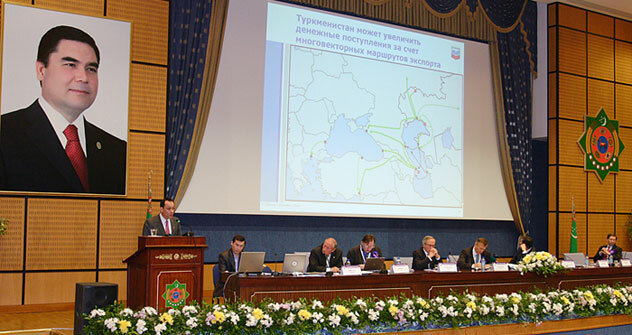 In the conference, Berdymukhamedov argued that “the realisation of the TAPI pipeline project will allow an increase in exports of Turkmen gas.” Turkmenistan, as per some estimates, has the second largest reserve of natural gas, and this reserve makes it one of the highest sources of energy hungry countries across the world including China, India, Pakistan, and the US and Europe. TAPI: A bridge too far? During the visit India had offered to invest in onshore gas producing fields and establish a gas based fertilizer plant in Turkmenistan. Last year Pakistan petroleum ministry had agreed on gas purchase terms with Turkmenistan. Asian Development Bank agreed to sponsor the pipeline which in 2008 was estimated to cost $7.6 billion. The 56-diametre pipeline starting from Dauletabad gas field of Turkmenistan will enter Herat of Afghanistan, then through Multan of Pakistan to reach Fazilka in Punjab province of India. It will cross 735 km of Afghan territory and 800 km of Pakistani territory before reaching India. The potential of pipeline is enormous not only in terms of gas supply, but also in terms of providing jobs to the local people and boosting economic development. Related: What will Russia's economy look like in 2030? I had argued earlier unless peace and stability return to Afghanistan, and trust restored between India and Pakistan the prospects of pipeline becoming a reality is a difficult proposition. In this sense, the reiteration of Turkmen President must be taken seriously to think positively in terms of how to bring peace and stability in Afghanistan. Can this pipeline emerge as a peace pipeline? Estimated to be operationalised in 2016, the pipeline project provides opportunity to regional players to seize the opportunity and think innovatively about the pipeline. Besides the four countries involved in this project, other countries like Russia can play an active role in supporting the project and further enhancing its stakes in peace and stability in Afghanistan. Not only that, such a development will further draw Russia into peace-building process in South Asia. Though Russian government has not expressed its response to the conference and its announcements, it will be interesting to see how Moscow formulates its policies in this context. Its involvement will shift the balance of the game in favour of regionalism, and raise Russia’s stakes in Central Asia and South Asia. Indo-Pak relations are gearing towards normalcy, and the cooperation of both the countries in building the pipeline will strengthen the constituency of peace. Besides the peace and economic development factor, the pipeline project if materialised will be the first joint collaboration in building a gas pipeline. There are complicated issues such as safety of the pipeline, instability factor, extremism and terrorism menace, but the leaders of the both the countries need to sort out differences. In the age of globalisation and economic diplomacy, geopolitics cannot be the sole factor in foreign policy making. Pakistan’s granting most favoured nation status to India is a welcome step in this regard, and also the bilateral negotiations on liberal visa regime. Both are energy hungry countries. India’s energy demand is rising exponentially, and rising energy consumption and relatively flat production at home has left it increasingly dependent on imports. It was the world’s fifth largest net importer of oil in 2010, importing about 70 percent of consumption. Pakistan’s energy scenario is equally precarious. Among the Eurasian players China has adopted a more dynamic approach to exploring energy in Central Asia. The 3666-kilometre Central Asia-China pipeline from Turkmenistan to China is a vivid testimony to this dynamism. After the withdrawal of the International Security Assistance Forces, led by the US, from Afghanistan in 2014, multiple prospects appear in sight. In a post-NATO scenario, a power vacuum may emerge unless the civilian government of the country takes full and legitimate control of political and economic set up. Any return of the Taliban will only perpetuate or further aggravate the crisis with daily dance of religious hatred and violence. And if the pipeline is established by that time, or will be in the process of competition, it will then be left open to daily threat of Taliban attack, or attack by other groups whether state sponsored or not. What I argue here is that the pipeline can be an opportunity for the regional players to cooperate in the completion of the project. This opportunity can be lost, if the players put premium on narrow sectarian gains than on larger interests – both national and regional. The regional cooperation can be further strengthened by widening the net of relations into other areas such as developing common front against extremism and drug trafficking. In the context of transportation, there are projects such as North-South corridor, which can be developed with joint collaboration. The TAPI pipeline certainly provides an opportunity for the countries of the region, including India and Russia, to further strengthen their partnership.